Is your hospital fit for the future? An independent report released from health analysts Dr Foster today, suggests that hospitals in England are ‘full to bursting’, leaving staff struggling to maintain high quality care to patients and creating a potentially dangerous environment. Based on NHS’s own performance data, Dr Foster’s report indicates that bed occupancy rates are well above 85% in our hospitals – the maximum rate at which patients are not exposed to healthcare risks. The NHS recognise that that bed occupancy rates above 85% within hospitals, compromise patient safety and increases the risk of spreading hospital -acquired infections. Further data, compounding this report, released from NHS’s Health and Social Care across 146 hospital trusts for 2011-12, show figures running at 90% capacity or higher. With this high number of bed shortages further increasing during the winter months, this puts additional strain on the NHS staff already struggling to cope with safety and quality of patients’ care, which can result in systems starting to breakdown. If systems do start to breakdown, one of the many consequences could be a rapid rise in HCAI’s that would pose a significant threat of associated infection spread among patients on packed wards, and the emergence of any new transmissible and seasonal diseases would make additional burden a regular occurrence. 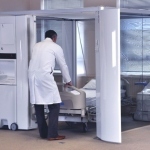 As a solution to infection control within healthcare environments, design consultancy Renfrew Group have designed a flexible isolation unit called the Temporary Side Room (TSR) that could provide hospitals with a solution to contain infections and make the environment safer for patients in the event of infection outbreak. Following Renfrew Group’s comprehensive design and prototyping of the Temporary Side Room 1 & 2 with the Department of Health and NHS, a new specification has now been proposed, with the object of producing a more commercially attractive product for the NHS. The new designed TSR 3 can provide hospitals with isolation facilities that effectively reduce airbourne and physical transmissions, provides a barrier around patients, reducing patient and surface contact. It is easy to clean, fast to erect and dismantle, and incorporates features requested by clinicians and infection control leaders such as an integrated wash station and emergency access. However, Renfrew Group recognise that to deliver this innovative product design as a real solution to Infection Prevention within hospitals, we are seeking manufacturing and investment partners to market the solution to meet the substantial, unmet NHS demand. Whilst the potential threat of increased HCAIs is, of course, only one side effect on the overcrowding issue facing the NHS today, the contagion effect on our overburdened healthcare system is something we should prepare for sooner, rather than “later”. Previous post Best of British Next post REMEMBER…EVERYTHING’S BETTER IN A SWEATER!! !